Honkyoku, the "original music" of the shakuhachi, represents one of the major genres of traditional Japanese music. The name of the instrument is derived from an ancient system of measurement, shakuhachi being the corruption of i shaku ha sun which literally means 1.8 feet, the length of the classical flute. Instruments ranging in size from 1.3' to 2.4' are used in concert and flutes as long as 3.2', while less common, are also played. According to one theory, origin of the family of end blown reed flutes of which shakuhachi is a part, has been traced back as far as ancient Egypt and is presumed to have migrated through India and China before entering Japan in the latter half of the Seventh Century. Its popularity, however, was short-lived and it wasn't until the Thirteenth Century that it was revived by the Fuke sect of Buddhism which sought to replace sutra chanting with sui zen or "blowing zen." Not until the Edo Period (1603-1867) did this instrument reach its final and most decisive phase of development. During this era, marked by the disintegration of feudal Japan, the shakuhachi was favored by swelling numbers of uprooted samurai warriors (ronin) who joined the ranks of itinerant preachers known as komuso ("Priests of Emptiness and Nothingness"). 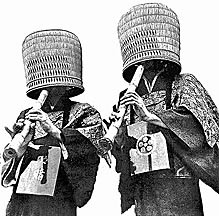 The komuso wore large baskets (tengai) over their heads to symbolize their detachment from the world. Violent clan struggles which marked the late Sixteenth Century forced some of the komuso to organize themselves into a society for self-protection. Members of the Fukeshu sought to deceive the shogun -- Japan's supreme warlord -- with forged documents giving them exclusive rights to play the shakuhachi and to solicit alms with it. In return for this privilege they agreed to spy on the activities of other ronin. Legend has it that these komuso, forbidden to carry their revered swords, redesigned the shakuhachi from the root of the bamboo making it longer and stouter for use as a club as well as an instrument for spiritual attainment. Fukusetu Dosha, is credited by some historians as being the first komuso. A detailed history of the shakuhachi can be found in Christopher Blasdel's The Shakuhachi: A Manual for Learning. The second half of this excellent book is Blasdel's translation and adaption of Yuko Kamisango's historical treatise. The Japan-America Society of the State of Washington has a wonderful website offering a virtual tour of old Edo (Tokyo). This site provides a wealth of information in text, images and artwork from the period of the context in which shakuhachi reached its highest state of development.